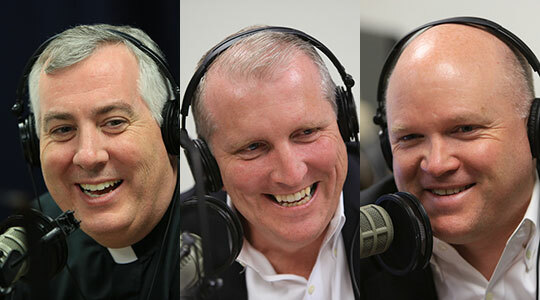 Summary of today’s show: Kevin Kiley has worked for the Archdiocese of Boston for most of his adult life in what he describes as a calling to serve God and the Church. Scot Landry and Fr. Mark O’Connell talk to Kevin about his service, including managing the massive move from the chancery in Brighton to the Pastoral Center in Braintree in 2008 as well as shepherding budgets through difficult times and aiding unprecedented financial transparency. 1st segment: Scot welcomed back Fr. Mark and asked him what he was up to last week when he was away. Fr. Mark said he was at a board of governor’s meeting for the Canon Law Society of America at the airport hotel in Baltimore. Scot said many who work at the Archdiocese serve on national boards and committees in the Church. Scot said this weekend will also be the 5th annual Eucharistic Congress for College Students and Young Adults in the North End of Boston on Friday night and Saturday morning. Also next week, there will be seminars at the Pastoral Center for priests and laity on the topic of the Church’s teachings related to Women and Sexuality. Find more about the seminars at Pilotnewmedia.com. 2nd segment: Scot and Fr. Mark welcomed Kevin Kiley to the show. Kevin has worked at the Archdiocese for 20 years when he was 25 years old and newly married. He’d worked a few jobs after college and his last job was sales. One of his clients referred him to a friend at the Archdiocese. He did work a couple of years outside the Archdiocese and came back in 2004 because he missed it. He grew up in Weymouth in St. Albert’s parish with his two older sisters. At the time he didn’t know how much his faith meant to him, until he came here to interview. His brother-in-law, Fr. Paul Hurley, who is a chaplain with the 101st Airborne, was just entering the seminary at the time. Fr. Mark said Kevin used the word “call” and a lot of people have a calling to work for the Church. Kevin said he’s seen a lot of people come and go. Even while he was away working at a for-profit company, he still helped out at St. John Seminary and had a side practice as a parish consultant, so he kept his hand in it. People are drawn to serve the Church. Scot asked Kevin what he missed during his two-year hiatus. Kevin said it’s the atmosphere, the ability to go to daily Mass. His prayer life suffered a bit because he wasn’t spending time in the moment not being here. Scot said Kevin’s worn many hats in his time. Kevin said he started as an accountant. He moved up to accounting supervisor and accounting manager and then assistant comptroller. He grew into a budget role. When he came back, he did more with the budget, and then when Jim McDonough came as chancellor in 2006, he worked in planning and projects. He worked with human resources and then the Pastoral Center project came along. He hadn’t had experience with facilities management or construction before, but he determined to form relationships with the right people. Scot said Kevin had a good handle on all the work that was needed for a massive relocation from six locations to here under budget and on time. Kevin said the Pastoral Center building had been a financial services company with 500 people working in it. Tom Flatley sold the building to the Archdiocese for $1 and when Kevin came into the building for the first time, it was obvious there was a lot of construction that was going to need to be done. They had to plan to lay out the whole building. The most challenging part was sitting down with people to determine what they need. He needed to lay out a functional workspace for each department. They brought in three buildings in Brighton, and offices in Dorchester, West Roxbury, and downtown Boston. They built a new chapel. He remembers a few times wondering how it would possibly happen. Everything that good go well went well. When they told other building managers that they would start the move and be done in a week, they got disbelieving laughter. Scot said the plan was to have everything working and open for business in one week: telephones, computers, voicemail, and so on. He recalls the reservations at moving from the center of the Archdiocese to an office park, but when people walked into the building they felt at home. Kevin said they didn’t just move, but had brand new telephone system, brand new networked printers, brand new data center and it was a lot of change at once. Everyone had a new workstation and felt like they were moving into a brand new home. It was a place to be proud of. Scot said it’s truly a center of pastoral activity because of all the conferences and activity going on here. Scot said in the first year, there 25,000 people to come through for various seminars and trainings. Kevin said the ability to gather together in the full-service cafeteria, which we’d never had, is a whole new atmosphere. Scot asked Kevin about the highlights of the project for him. Kevin said he treasured the relationships he formed, including with Paul Morin, who’d worked with Flatley for many years and came to work with us; people at W.B. Mason; Dan Guerra who was IT manager at the time, and others. The reason the building came to gather they way they did was the relationships. Everybody was on the same page with the same mission. Kevin said they had a very tight deadline with Boston College. We had to be out. Fr. Mark said until they got here, he didn’t realize how much they needed to get out of the old spaces. What makes the most difference for how we minister as a Church is the relevance. When you drive down Route 128 and see the glowing cross at night, the Church is more available. It’s a more inviting experience. That said the Brighton campus was beautiful, although the buildings on the inside were antiquated. Fr. Mark said one of the best benefits is the amount of work that gets done in the hallways and cafeteria that didn’t get done when they were in six buildings. He said there are a lot of people who come from the community to daily Mass every day. Kevin said he’s glad they were able to keep the crucifix from the old chapel. Kevin said the monthly staff meetings in the auditorium of the new building are great compared to the old Peterson Hall gatherings which occurred irregularly in a dingy atmosphere. Scot said Kevin’s current role oversees many projects in the Archdiocese. He assists the Cardinal in the allocation of resources to all the ministries. Kevin said we don’t make widgets and sell them, but rely on donations. He said the size and scope of the Archdiocese, it rivals major corporations that 1,000 people in the home office, while we have a little more than 200. Ten years ago we had 400. Then we had $40 million budget activity and now it’s $28 million. The most difficult part of the job is trying to do what needs to be done with less. Kevin said no one takes it personally when he sits down with them to talk about budgets. It’s always difficult, especially when reducing staff. Unfortunately the economy is a key driver in how the organization goes. There’s a lot of balancing scarce resources and prioritizing. No one thinks they have enough to do what they need to do. Infrastructure expenses take up a lot of resources. While they have had to cut back, a lot of cuts have come from administrative services to reduce the impact on mission services. He said if there was a $20 million Appeal it would be a lot easier. Scot said the Archdiocese is recognized nationally for financial transparency. Kevin publishes the budget annually and there is a lot of detail that wouldn’t be available anywhere else. They try to show what the Corporation Sole is comprised of and the Central Ministries. They drill down into each cabinet secretariat, give a brief description of each agency and department’s mission. It’s pretty comprehensive. Scot said many pages describe how many people work in each ministry. Scot said many offices have just one or two people. Kevin said there’s almost 300 parishes, 100 schools, and 50 affiliate organizations, but there’s a very small home office to oversee and provide support. Kevin said you have to be as transparent as you can. Scot said people don’t often understand how complex the Archdiocese is from a corporate standpoint. It is a Corporation Sole with 4 different groups in it, plus many other related entities, like iCatholic Media, of which TGCL is a part. Kevin said the Corporation Sole is the parishes and schools; self-insurance fund and risk management; a small endowment; and central operations. Within Central Operations is unrestricted operations; restricted funds, reconfiguration fund, and special collections. Unrestricted operations is the Central Ministries activity. The parish and school aspect is not centrally controlled. Kevin said the parishes and schools have done well with transparency. Kevin said he looks at about 100 different budgets, each with about 50 different line items. In the past couple of years, they implemented a new financial system called Lawson. It’s been beneficial. Part of the challenge is just trying to find the time to use the system more effectively. In the past there were more people in the Finance office dedicated to those efforts than there are now. Kevin lives in Marshfield and they have four children, three boys and a girl, from 12 years old to 17. They are parishioners at St. Christine’s. He loves being able to help out at the parish and all of our parishes need good volunteer help. He praised Fr. Tom Walsh the pastor of his parish. They then discussed what it’s like to have his wife’s brother as a priest. He recalled when his brother-in-law was a seminarian having so many of them over to the house. Kevin said Fr. Hurley has done a couple of overseas tours and just came back from Afghanistan last year, telling stories that are gut-wrenching. 3rd segment: Now as we do every week at this time, we will consider the Mass readings for this Sunday, specifically the Gospel reading. in his name this man stands before you healed. that we may be called the children of God. is that it did not know him. what we shall be has not yet been revealed. for we shall see him as he is. “I am the good shepherd. A good shepherd lays down his life for the sheep. and the wolf catches and scatters them. This is because he works for pay and has no concern for the sheep. and I will lay down my life for the sheep. I have other sheep that do not belong to this fold. and there will be one flock, one shepherd. because I lay down my life in order to take it up again. No one takes it from me, but I lay it down on my own. I have power to lay it down, and power to take it up again. Scot said the Gospel of the Good Shepherd is where Jesus owns his decision to lay down his life for us. His favorite line is that Jesus knows us individually by name. Kevin said it’s profound and comforting. In these difficult times when people are struggling, knowing we have a shepherd who loves us is comforting. Scot said in the second reading that knowing we are God’s children is also a form of comfort. Fr. Mark said any Jewish person hearing this would recall Ezekiel, chapter 34. It speaks of the scattered sheep that God sees. He promises them a shepherd who will bring them back and they will be his. So Jesus assures us he is the fulfillment of that prophecy. We are his flock that he will lead. When the sheep see the shepherd is confident and unafraid, they will be okay. Scot said it’s easy for him to feel close to God being described as a child than being described as a sheep. Being a child is God is wonderful. In the darkest days, step back and think about what being a child of God means. He will hears and love us non-stop. Fr. Mark said Scot and Kevin both responsibilities to their own children and they know that if they are faithful, the children will feel safe. Scot said the other sheep Jesus refers to shows how he recognizes how scattered we can be and we should be one flock. Fr. Mark said a lot of people are scattered and wandering outside the flock. We have a mission to spread the Gospel that the Church is less without them. Scot said this Sunday is World Day of Prayer for Vocations. Fr. Mark said it’s amazing how many people take it seriously and make a special effort to write to priests and express love and appreciation on Good Shepherd Sunday. Kevin said the rejected stone becoming the cornerstone is so profound. He feels bad to for those who don’t have faith to be able to turn to the Lord in difficult times. Fr. Mark said it’s been a difficult few years for Kevin as the budget guy. He notes how Peter was challenged in the reading too. Kevin has stood up as well to declare what needs to be done. The Good Catholic Life Copyright © 2019. All Rights Reserved.